Thorvar Crittersmash, a jolly man who wishes to bring Christmas to his fellow Fremenniks, has received permission from the Queen of Snow to host this year's Heimland Games in the Land of Snow. However, he seems to have lost the equipment required for the games! Help him recover his equipment from the Christmas Dungeon and save the games! Note: This event was only available from 20 December 2010 until 4 January 2010. Talk to Thorvar Crittersmash in Daemonheim. Travel to Daemonheim, or enter any one of the four cupboards that can be found in Lumbridge, Draynor Village, Varrock and Falador. The quests location will be marked on your map by a holiday symbol (represented by a wrapped present) . 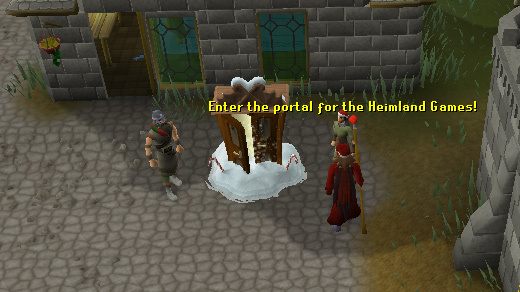 A Fremennik man and woman will be standing by a Christmas cupboard covered in snow. You may speak to the man or woman and ask them questions about the Heimland Games if you wish. Speaking with either Fremenniks is not important as you can enter the Christmas cupboard by clicking on it. 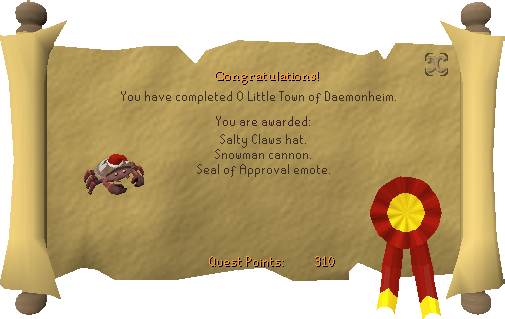 Getting into the Christmas cupboard will teleport you to Demonheim a safe part of the wilderness where the skill Dungeoneering is primarily trained. Talk to Thorvar Crittersmash the rather large man in a Santa costume and a Fremennik helmet. Ask who he is. He will admit to being Santa and explain how he lost a few of his possessions required for the Heimland games and more importantly his hat. If you accept the offer to search for his items he will hand you Thorvar's bag and Thorvar's bucket. A normal bucket will not work for this quest and if you lose either item you can get another from Thorvar. When you are ready talk with Thorvar and he will teleport you to the dungeon. Head north and you will notice the door ahead is blocked. You must solve the puzzle in the room to progress. In the middle of the room there will be a blue switch, tap this switch and watch closely as the icicles in the room light up one by one, memorise the pattern as the icicles light up, then tap the icicles in the same order as shown by the switch. Tap the switch again to reset the puzzle and to see the pattern again. Each pattern will be different for everyone. Repeating the pattern correctly will complete the puzzle and will remove one of the icicles that are blocking the doorway, repeat the puzzle a total of three times to remove all the icicles and gain access to the northern door. You will not be able to enter the next room until you find the Snowman accessory found near by the south-western icicle. Picking it up will place it in Thorvar's bag. The next room's extreme cold will reduce you to your knees as you will be forced to crawl. Your goal is to touch the Snow Angel statue without getting caught. She will catch you if you're not hiding behind a wall of snow and will teleport you back to the start of the puzzle. A light in the top left hand corner of your screen will indicate when it is safe to move. Move whilst the light is green and hide whilst it's red, the snow angel goes long green, red, short green, red, and repeats this pattern. Go on the long green, be patient and move right after the light turns green. 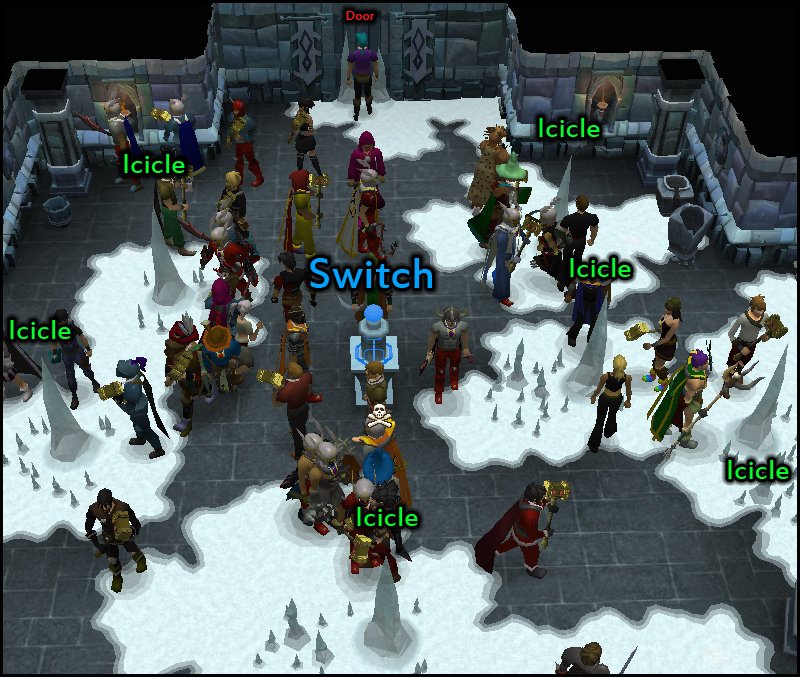 Once you touch the Snow Angel statue you will be teleported to another puzzle room. You cannot cross the ice as it is too thin to hold your weight. On the ground in a pile of snow, pick up the Trinket of sealification which will be placed in Thorvar's bag along with the Snowman accessory you had found earlier. Right-click Thorvar's bag and select 'Use trinket' to be magically transformed into a seal. Once you are on the ice you will start to skid, use the forward, left and right control's on the bottom of your interface to navigate, avoiding any cracks in the ice that will teleport you back to the start of the puzzle. Once you make it to the end and down the green cracks in the ice you will be teleported to yet another puzzle room. Step through each portal on the first wall until you manage to get through. Remember which portal moves you north and avoid those that move you back. Pick up the snowmaker and the pair of iceskates on your way otherwise you will not be able to move to the next puzzle. You've made it this far, this will your last puzzle. The goal is to catch the crab wearing the Santa hat. The crabs will come out of any of twelve cracks in the frozen pool. When you see the crab with the Santa rise from the water, click on it to attempt to grab it, you will slide across the lake and sweep at it. It will take a couple of attempts to grab the crab, each time you catch the crab it will slip away and a portion of it's energy bar will deplete. Once the bar is empty you should be able to catch him. Once you've caught Salty Claws you'll be taken back to Thorvar who promises a reward for your efforts and offers you to watch the Heimland Games. Accept the invitation to visit the Heimland games. Unlimited access to the Heimland games during the Christmas season. You can throw snowballs at other players, build snowmen, skate on a frozen lake and slide on three different slaloms of various difficulty as a seal. The hat can be worn and stored in your POH costume room. If destroyed or lost you can get another hat from Diango in Draynor village. When worn you can right-click the hat and select the Dance to make your player perform like a crab, scattering left and right. 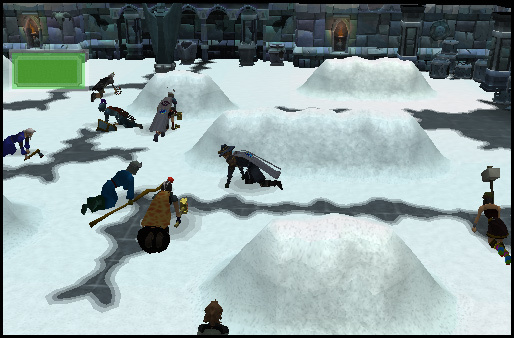 The souvenir can also be stored in your POH costume room and can be collected from Diango if you happen to lose it. Left clicking on the snowman souvenir will activate the snowsplosian emote. You will turn into a snow man and balls of snow will be shot into the air. As you go down on one knee you will be magically transformed into a seal. Clapping your hands (flippers) for a while until you return back to your normal self. If this is your first Christmas event, you will unlock all prior Christmas emotes as well.